If you keep pet chickens, you'll have to make some preparations to ensure your pets are ready for the cold weather. Fortunately, chickens prefer cold weather over hot. They prepare themselves for winter when they feel it coming by developing new feathers, producing less, and eating more than usual. Do your small part to help and your chickens will live comfortably through the winter. Keep your chickens' water source from freezing. If you have electricity to your chicken coop, use a heated waterer to keep your chickens' drinking water from turning into ice. If you don't have electricity in the coop, prepare waterers in your home with warm water and take one to the coop a few times a day. Chickens prefer warm water in cold temperatures because it helps them stay warm without using their own energy. Feed your chickens corn in addition to their normal diet. Corn produces more energy in the digestive process than other grains, keeping the bird warmer. Corn also turns to fat, which helps insulate your bird from the cold. Don't use corn as an alternative to your chickens' normal diet, though. Just include a few handfuls in their diet as a daily treat. Other fatty scratch grains will serve this same purpose. Keep your chickens 5 percent to 8 percent heavier than they are in the warm months. Repair holes or drafty areas in the coop. Filling in holes will keep your chickens warmer and will prevent hungry predators from feasting on your chickens. Food can be difficult for some animals to find in the winter, and your chickens are easy prey. Make sure that the roof doesn't have leaks and that the latches on your doors are tight. 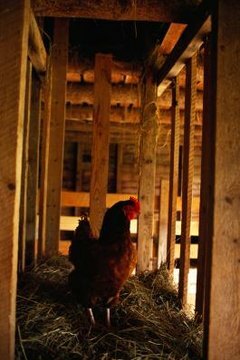 Properly insulate your chicken coop to keep the chickens' body heat within. Pick up your chickens' eggs each time you go out to replenish their water. Chicken eggs are mostly water; they'll crack when they get cold. Change the bedding in the coop whenever you notice it is moist. Any material that is damp or wet will make the coop colder -- and can cause your chickens to get frostbite. Clean your chicken coop at least twice a week. Check on your chickens and remove their eggs two or three times each day.  If you anticipate below-freezing temperatures, rub petroleum jelly on your chickens' combs and waddles to prevent frostbite. Thaw the combs and waddles in lukewarm water if they are already frostbitten, then apply the jelly to protect them.  Use radiant or halogen heaters for chicken coops only when experiencing a cold spell that lingers below 0 degrees Fahrenheit. Heaters can cause fire hazards. Chickens do not like sudden temperature changes; rather than supplement with heat regularly, it's best to let your chicken acclimate to the cold throughout the seasons and reserve supplemental heat for emergency preservation.